I don’t want to be a total dud, but I’m having such a good time in NYC this week! In fact, I stayed up until 1:30am last night getting this post done.. soooo I’m keeping it short and sweet on here today, but stay tuned for more outfit posts & more from New York tomorrow and later this week! You have no idea how happy Kate Spade’s flamingo pieces make me. I’m dying for the swimsuit in the print, if only it was in this flirty pink. I def need that flamingo makeup case! Love this cute little flamingo makeup case, among other things. . . like this Tory Burch top. Eeek, can’t wait to be in the city! Can’t wait to see NYC outfit posts and more! Hope you had a blast! Can’t wait to see your NYC posts. gorgeous! I adore those sunnies & that cosmetic bag. There definitely aren’t enough hours in a day! Love this roundup that white blouse is just so pretty. Obsessed with every single thing here. Good edit! Those flat sandals are adorable! Love all of these shades of blush and if I haven’t said it already, I’m SO excited for your London plans! Can I please come and visit you?! LOVE that flamingo cosmetic case!! What a perfect Mother’s Day gift! Love this edit! 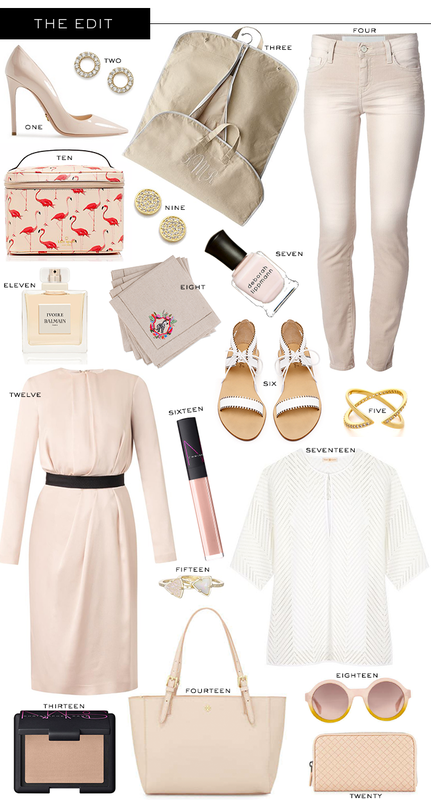 Neutrals are great for summer!